This GUI defines who to filter requirement. Some part of a document shall be ignored by the computation. 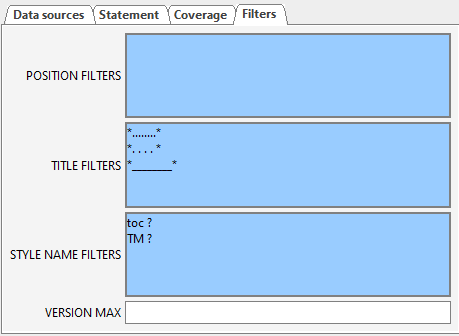 Position filters define the part of the document that will not be analyzed. The software ignores all the text at a position that matches a filter. The position format is file_name position_in_file. The filter value is case sensitive. The filter value can use * (one or more characters) or ? (any character) wildcards to filter a position that contains a text. Enter *§1 Introduction* to ignore this chapter in all documents. Please note that chapters are available only in MS WORD format and in some case in PDF format. Enter my file.pdf*P6* to ignore the page number 6 in the document my file.pdf. Please note that is this case pages 60 61 etc will be filtered too. Enter my file.pdf*§4* to ignore the chapter 4 and sub chapters in the document my file.pdf. The position of the text in the reports for an MS Word document is the last read title. When a requirement is defined (statement) or covered (coverage) before the first title, the position is P1 L1 for page 1, line 1. Some part of a document shall be ignored by the computation. This filter defines the part of the document that will not be read. It ignores the requirements whose title matches one of the filters in the list. The filter value is case sensitive. The filter value can use * (one or more characters) or ? (any character) wildcards to filter a position that contains a text. The default values for a new project ignore the requirement that contains dot line of table of content. This avoids several statements when the document includes a summary of requirements. Some part of a document shall be ignored by the computation. This filter defines the part of the document that will not be read. It ignores the requirements whose style name (Heading 1, toc 1 etc.) matches one of the filters in the list. The filter value is case sensitive. The filter value can use * (one or more characters) or ? (any character) wildcards to filter a position that contains a text. The default values for a new project ignore the standard style names included in a table of content. This avoids several statements when the document includes a summary of requirements. the requirements of the next version that shall be ignored. The user can still check the coverage of the requirements of the current version, even if the new requirements are not covered. The filter defines the requirements which will not be displayed in the report. The user enters the value of the current version in the VERSION MAX field. The requirements with a version strictly greater than VERSION MAX are filterer in the report. The requirement still exists and can be referenced by a coverage. For example, if you enter 1.2, the requirement with a version higher than 1.2.1, 1.02.05 or 2.10.01 will not be included.